Where can I find information on how to get to the Tower and where to park? Detailed information on travel and parking facilities can be found here. At the ticket desk in the Television Tower shop you can pay in cash or by debit (EC) or credit card. What cannot be taken up the Tower for safety reasons? • Glass bottles and glasses• All kinds of animals (with the exception of guide dogs)• Prams, skateboards, scooters, bicycles• Large items of luggage, such as suitcases, trolley cases, rucksacks etc. • Weapons, dangerous substances (e.g. compressed gas containers, fireworks etc. )Storage facilities are available in the foyer. Is the Television Tower open in all weathers? The observation platform is closed when there is a gale warning. If in doubt, please phone in advance to check whether the Tower is open: Tel. +49 (0)711 232597. Is prior registration required for groups or school classes? No prior registration is required for groups of under 50 persons. For groups of 50 or more, please let us know the date and time of your intended visit by using our contact form. In order to avoid queuing at the ticket desk, you can buy adult group tickets there in advance for later use, though you may still have to wait to board the elevators. Are there reductions for holders of state-subsidised social benefit passes, such as the Family Card? 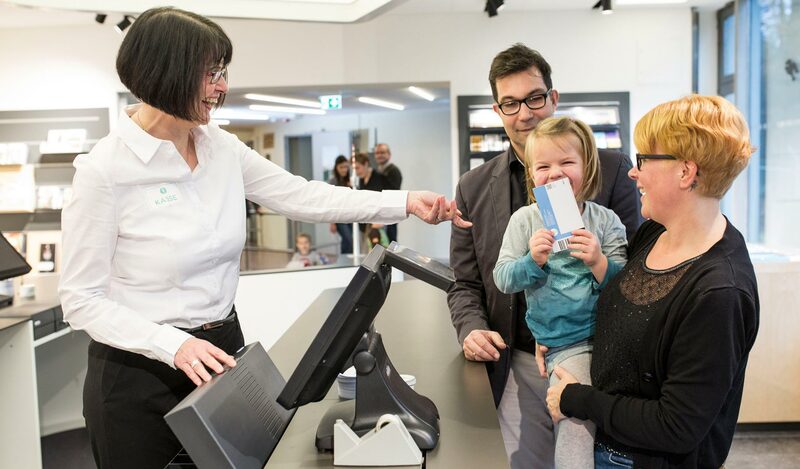 We accept the City of Stuttgart's Family Card and Bonus Card. We regret that the State Family Pass is not valid at the Tower. How long is my one-year ticket valid? Your annual season ticket is valid for exactly one year from your first ascent of the Tower (independent of calendar year). Can you send me admission tickets by post? Unfortunately we cannot send you admission tickets by post. Can I buy a gift voucher for the Television Tower? Gift cards can be purchased from the Television Tower ticket desk for any amount you require. They can be used to ascend the Tower on the day of your choice, and/or exchanged for items from the shop. We regret that vouchers cannot be bought online or sent by post. For restaurant vouchers, please contact "Leonhardts" restaurant directly. Is the ascent of the Television Tower barrier-free? There is barrier-free access to the Panorama Café. For structural reasons, there is a 10-cm raised sill at the threshold to the observation platform, but this is easy to negotiate with the help of a companion. Just ask our lift attendants if you require assistance – they‘ll be pleased to oblige. Particularly large wheelchairs (e.g. power wheelchairs) might not fit through the doors to the observation deck. If in doubt, please enquire about the measurements prior to your visit. Please note that no more than three wheelchairs or rollator users can go up the Tower at one time. When does the Television Tower close on New Year's Eve? On New Year's Eve the Television Tower is open until 1 a.m. Tickets cannot be reserved in advance. How can I buy tickets for a guided tour? Tickets must be reserved in advance using our online form. Here you can register the date and time of your visit and the number of participants. Please collect your reserved tickets no later than 20 minutes before the start of your tour, as they will otherwise be released for resale. Tickets can be paid for along with your elevator ticket at the Tower ticket desk on the day of your tour, either in cash or by debit (EC) or credit card. Can I join a tour without prior reservation? Joining a tour without a reservation is only possible if reserved tickets have not been collected, or when there are last-minute free places available – please enquire at the ticket desk. We would recommend online reservations. Can I purchase vouchers for a guided tour? At present it is not possible to purchase vouchers specifically for guided tours. However, you can buy a Television Tower voucher which can then be redeemed against the price of a guided tour. Are guided tours available on days of the week other than Mondays? We regret that currently it is not possible to arrange guided tours on other days of the week, nor on specific dates of your choice. Are guided tours available for groups? And what is the maximum number of participants per tour? Special (exclusive) group tours are unfortunately not available at present. However, you can use the reservation form to reserve places for up to 30 persons. We regret that also for a number of up to 30 persons it is not possible to arrange guided tours on specific dates of your choice. For groups of over 30 persons, please contact us by phone +49 711 929 14575. Please note that the maximum number of participants per group is 50. Can wheelchair users take part in guided tours? Yes, we can accommodate up to 3 wheelchair users. Please inform us of this in the field marked "Nachricht/Leave a message" when making your reservation. Can I make a reservation at the Panorama Café and "Leonhardts" restaurant? Unfortunately it is not possible to make reservations at the Panorama Café at the top of the Television Tower. You can, however, reserve a table at "Leonhardts", the restaurant at the foot of the Tower. To do so, please contact the restaurant directly, either by phone, Tel. +49 (0)711 914 298 00 or via e-mail. For what kind of events can I rent the event area in the Tower pod? The event area at a height of 144 m can be hired for both corporate events (e.g. presentations, conferences, receptions) and for private functions (e.g. birthdays, weddings...). How many persons does the event area hold? The event area has room for up to 70 persons (incl. staff). The exact number depends on the type of seating required. How long can I rent the event area for? The rental period for the event area is by individual arrangement. The minimum rental period is 6 hours. What does it cost to rent the location? The cost depends on the length of the rental period and on whether this falls within the Television Tower's regular opening hours. We will be pleased to submit an individual offer. Please contact Kathrin Schäffler, tel. +49 (0)711 929 14741, or by e-mail. Which catering options are available? Catering can be arranged with "Leonhardts", the restaurant at the foot of the Tower. Please contact the restaurant directly, tel. +49 (0)711 914298013, or by e-mail. Alternatively, you can also hire other catering partners. Owing to the strict safety requirements, special regulations apply. You will receive more information on these when you rent the location. Civil wedding ceremonies are performed on the event level of the Television Tower at a height of 144 metres. How can I fix a wedding date at the Television Tower? Weddings are performed here on the first Friday of each month. In order to arrange a date, please contact the register office responsible, Standesamt Stuttgart-Degerloch. As soon you know the date of your wedding, please get in touch with Kathrin Schäffler, tel. +49 (0)711 929 14741, or e-mail for further information. Where can I get a filming permit for the Television Tower? For film enquiries please contact Claudia Hamann, tel. +49 (0)711 929 13305, or by e-mail. Can I fly my drone at the Television Tower? Flying drones on the premises of the Television Tower, either privately or for commercial purposes, is basically prohibited.